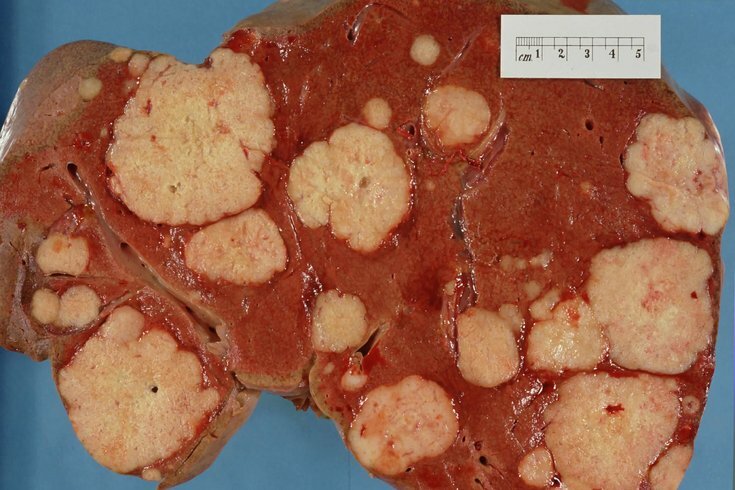 A cross section of a human liver shows multiple paler metastatic nodules that orginated from pancreatic cancer. When cancer spreads, it frequently ends up appearing in the liver thanks to a chain reaction that makes the organ particularly vulnerable to cancerous cells. The National Cancer Institute lists the organ as one of the main sites of metastasis for at least 13 different cancers, including those of the breast, colon and lung. Researchers at Penn Medicine have identified the source of that chain reaction – a discovery that could in turn help limit cancer from spreading to the liver. Their findings were published Wednesday in the journal Nature. The liver's chief functional cells, known as hepatocytes, kickstart the chain reaction, according to researchers at the Abramson Cancer Center at the University of Pennsylvania. In response to inflammation, the hepatocytes activate a protein that increases production of additional proteins that remodel the liver. That process produces a so-called "soil" that enables cancer cells to "seed" within the liver. But researchers say this entire process can be prevented by using antibodies that block the inflammatory signal that prompts the hepatocytes to begin the chain reaction. "The liver is an important sensor in the body," lead author Jae W. Lee said in a statement. "We show that hepatocytes sense inflammation and respond in a structured way that cancer uses to help it spread." Researchers made their discovery by comparing mice with pancreatic cancer to healthy mice. Nearly all hepatocytes activated in the mice with cancer, but less than two percent did so in mice without tumors. They later found the same pattern when examining patients with pancreatic, colon and lung cancer. The study was supported by the National Institutes of Health and other funding sources.